Last week we hosted Claudio Italiano and had a very productive trip to New York and San Francisco. We're pleased to announce that we will be hosting a new visiting tailor in a couple of weeks: Guido Davi (@sartoriadavi). Guido will visit New York on May 8-10. Unlike most visiting tailors, Guido and I are experimenting with doing 2 complete fittings in a single visit. We are trying this with one client and hope to offer this to more clients in the future. Nearly all visiting bespoke tailors limit themselves to a single fitting with each client (1 fitting per trip). For new clients, this typically necessitates at least 2 separate trips to prepare a jacket for delivery. The entire process can take up to a year. In contrast, our approach will greatly speed up delivery without compromising the bespoke process. Guido and his brother run a workshop started by their late father more than half a century ago. The more I learn about how they work, the more impressed I am with their attention to detail and uncompromising approach to tailoring. Guido cuts a clean, soft jacket that he shapes in subtle ways for each individual customer. His clientele is among the most international of any Sicilian tailor, which is a key advantage in my book. Moreover, his English fluency and tailoring skills make him the obvious choice for the most direct, undiluted experience of Sicilian tailoring available in the US. Last but not least, we’re also working on offering bespoke shirts in collaboration with a Sicilian shirtmaker. For more info, feel free to check out my blog entries on Guido. Additional updates to appear on this newsletter as well as the Sicilian Reserve and Sleevehead websites. We're excited to announce the latest iteration of Sicilian Reserve as a platform to help connect Sicilian artisans to new customers. Our primary role will be partnering with tailors and artisans on their visits and trunk shows. To kick things off, I will be working with Sartoria Italiano (@sartoriaitaliano) for a spring 2019 visit to the US. Claudio and his father run one of the leading tailoring houses in Palermo. I really like his trim, modern take on the Palermo-style jacket. Claudio is impressively versatile and can shape jackets with a more classic silhouette. But he loves creating smart, superbly modern jackets that could easily be worn on the red carpet and eclipse anything I've seen on the award shows. Excellent choice for those who enjoy color and texture realized in an elegantly shaped jacket. Dates: April 8-9 in New York City. April 10 in San Francisco. By appointment only. For more info, feel free to check out my Sleevehead blog post on Claudio, or contact us with any questions. Last but not least, we're planning to bring Sartoria Davi, another superb Palermitan tailor, to the states later this year. Additional updates to appear here and my Sleevehead website. Beginning in 2019, Sicilian Reserve will become more of a platform to help connect Sicilian artisans to overseas customers. Our primary role will be assisting tailors and artisans to organize their visits and trunk shows. This has one main advantage - you can express interest in having a Sicilian tailor or artisan visit your city. Artisans will be able to gauge interest in cities around the world and respond by organizing a trunk show/visit if demand warrants. To make your voice known, join the Sleevehead Forum and show your interest on the tailor's dedicated topic page. Artisans participating with Sicilian Reserve will most likely have been profiled already in my book Sleevehead’s Guide to Sicilian Tailors (SGST) but this is not a requirement. If you know a tailor not covered in SGST or my blog, feel free to start a discussion topic in the Sleevehead Forum. To kick things off, I have already selected two well-known Palermitan tailors for a spring 2019 visit to the US and am currently finalizing details with them. An official announcement is coming soon. MTM is essentially off-the-rack with additional flexibility to personalize a number of features such as cloth, lining or lapel width. Thanks to the renaissance in menswear in the last five years, dozens of new brands have emerged offering “custom” shirts, jackets and suits in North America and Europe. From an affordability perspective, this is a good thing. These MTM brands can offer great value by sourcing from very efficient, usually overseas factories to keep prices down. MTM can provide a decent fit assuming your build and figure closely matches one of their fit models (Each fit model is based on an idealized person’s measurement). But let’s be clear - this is not true bespoke. No one is actually converting your specific measurements and posture into a personalized pattern and transferring that pattern to cloth to create a finished garment from scratch. With bespoke, a tailor takes your measurements and transforms your cloth into a garment shaped for you. With MTM, this 1:1:1 correspondence breaks down. With RTW or MTM, the goal is economies of scale. Think factory, not workshop. For instance, one successful menswear brand recently produced 50,000 MTM pieces in just one month. Even a luxury menswear brand like Kiton, which limits annual production of outerwear to 20,000 garments, must resort to industrial production methods. Today’s MTM, whether affordable or luxury, loses the vital, personal correspondence of you + tailor + cloth. In the not too distant future, we can expect automation to further disrupt MTM and bespoke tailoring. Tailor-bots will be trained on thousands or millions of human measurements to spit out patterns. Sew-bots will automate the sewing and construction of garments. 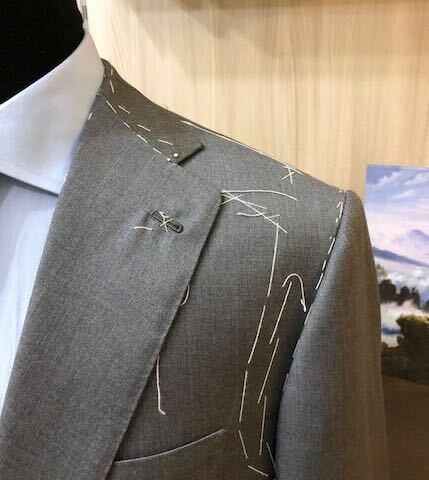 Even with this intelligent automation, I believe tomorrow’s tailor-bots and sew-bots will still lack what only a human tailor’s holistic experience can provide. But that’s another discussion entirely.